I've been following Everything LEB's blog for a while now but this project just blew me away. 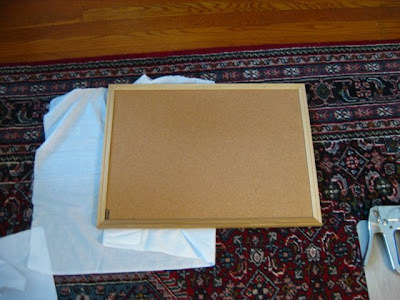 The homemade message boards are nothing new but her take on the project epitomizes style. Simple, cheap, chic and defnitely practical. How amazing would these look in a set of 6 or 9 in an office? Or with a variety of coordinating fabrics in a family room or nursery? The options are endless. Thanks for sharing LEB! This is going directly into my idea file for the future. Oooh, I love this too! 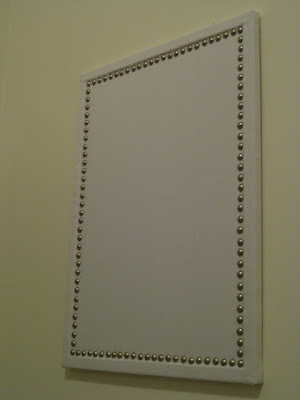 Reminds me of freckles chic's nail head trim headboard! Aw, you are so sweet! I'm so glad you liked my cheap and chic project- post pictures of yours when (and if) you make it :) Thanks you posting about it and linking my blog- you are the best! !